The establishment of the lower labial ornament (called dhébé ) occurs before the age of 10 years after extraction of the lower incisors , the lip is pierced and a wooden peg set up , and the hole is enlarged year by year by introducing more cylinders and larger , until establishment of a large clay disk decorated with engravings. Some anthropologists argue that making ugly women to protect them from slave raids this mutilation was to lip . Nowadays , the function is only symbolic since only high caste women are entitled to wear them. The board size is a measure of the dowry demanded by the family of marriageable girls , dowry consisted of cattle and goats and a firearm. This is not the only adornment of women who also wear necklaces made of shells or beads and shave the skull . In addition, men and women pierce their ears where similar disks ( or rings of wood ) are inserted and wear scars on her arms , stomach or chest. In men, these scars , figurative , commemorate an act of bravery and awe-inspiring group members . The women wear the scars on the shoulder which is their tribal “identity card ” while necklaces, bracelets, mischievous smiles , looks scoundrels and breast paintings betray a desire to please . The donga is the name of a rather cruel tournament which takes place at the end of the rainy season , the most awaited by young single moment. This is an opportunity for men who wish to marry to prove their courage to the whole tribe. The rules of those games where fighters compete armed with poles are simple : give a severe correction to his rival , avoiding the killing, ” burr ” formally punished. The winner that eliminated all his opponents is carried in triumph before an audience of young girls. One of them will choose the hero husband. The Mursi live in a remote area of Ethiopia. They reign supreme and live in perfect harmony with the environment. They form a homogeneous group , governed by secular dogmas and ancient rituals . They have little interaction , even peaceful , with the other peoples of the region and fight fiercely to spear and Kalashnikov , cattle rustling and raids carried out by women from other ethnic groups in their territory. They regularly quarrel with Hamar . Nyangatom , ethnic minority ( 15,000 representatives ) of Karimojong group , live in the extreme south- western Ethiopia , bordering Sudan and Kenya , in a particularly inhospitable Ilemi Triangle region . This border area was conquered by Emperor Menelik in 1899 but remained purely nominal Amhara occupation and the area was not settled . Nyangatom have always been in conflict with their neighbors and they are among the most feared of the Omo Valley Warriors . In the 70s , they were practically decimated by Dassanech . But in 1980 , benefiting in some way from the civil war in Sudan , they could equip themselves with guns and the tide turned . Nyangatom Toposa are related to their own neighbors with whom they are not in conflict. 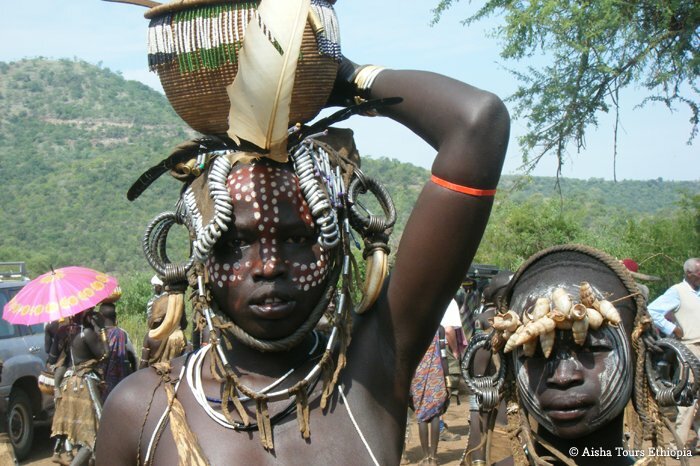 Their language is one of the Nilotic languages ​​is owned by the Teso – Turkana group. Their neighbors call them by pejorative name Bume , meaning ” those who feel bad.” Themselves prefer to call them by their nom de guerre Nyang -atom , that is to say ” yellow guns ” rather than by their former nickname ” elephant -eaters ” Nyam- etom . The originality of the Nyangatom culture is how they classify individuals into categories according to the elements of their status and is recognized as Elephant and Ostrich although there point surname but only a birth name and territorial belonging (eg that of the Storks , the Flamingos , the Ibis ) ensuring access rights to resources . Without centralized political system or report dominant-dominated with their neighbors, but sensitive charismatic power , they are not clan or lineage but generational division. Generation is divided into age groups and these in local groups. Nyangatom harvest sorghum , maize , beans, collect honey , dry the fish they catch , the time to live in a camp near ephemeral pastoral mobile and hostile neighbors more often , playing their pastures and livestock. In the year , as measured by the lunar and starting with the first rains, floods alternate with human concentration and drought , causing dispersion of groups. For wealth, in this culture of poverty but nevertheless expertise , the man his flock , his wives and children, but also his body ornaments , the headrest and weapons . At his death , the former has its place in the Pens zebu under a mound of dried dung and mourners to whiten body sorghum flour . As for Evil Dead , they are left to the vultures and hyenas.